Mind Tamer site is going to be a work in progress. The things that I am putting up on the site now may change later, or may move to a different module or so forth. It will continually change and evolve as I do and you do. So your feedback is very important. Without it I will not know what is working and what is not. My life has constantly been change ever since the 6th grade. All has progressed to be better and better, with a few exceptions, each and every year to the present. 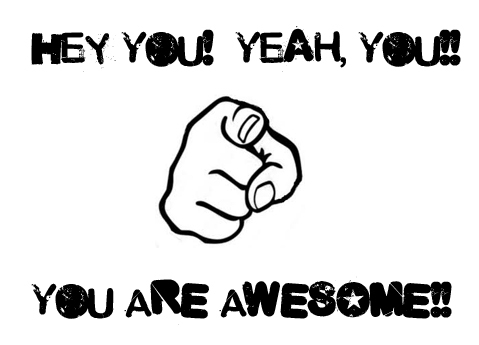 And I fully expect it to get better each year from here on out as well; And for you! I will get into my story a little in a bit. But you have to come into this program with the expectation that you will succeed. If you fall or hit a road block, (which is to be expected), you will simply find a way around it or simply SMASH through it. This program is all about CHANGE. A lot of people want to change. They want to change a lot of things about themselves. But sometimes they are just so afraid at what might happen if they fail, what happens if they succeed (YES The fear of success), how will your life be different– will it be better or worse, will the CHANGE be worth it in the end, what do I have to give up in order to make it happen? All of these are logical questions, that you and I, and the other members of Mind Tamer are going to go through together. Together is the key word. This isn’t about just losing weight, or getting in better shape, or fixing your nutrition, this is a life transformation program. Because erveything is connected. Our body and mind is one. At first we will focus on your body and nutrition, but when we improve our body and nutrition through good solid ‘diet’ (that will be the last you hear that word, explanation to come) and physical training, then naturally everything else starts to improve in all other areas of your life. From health, family, work, fun, friends, financial, emotional, spiritual. This will take some time. Do not expect to become a master of yourself (mind, body and spirit) in a month or 2 or 3. Becoming better takes time. You can’t graduate Kindergarten and then go into the 3rd Grade. You can’t pass your 5th grade math class and then expect to take and pass College Algebra (took me 4 times to pass it). This is a journey. But it starts with one foot forward, just like every journey. You have already expressed that you are ready and taken that first and most vital step. But first you are basically going to be starting out as a baby. First you need to learn how to crawl, then you need to learn how stand, then you need to learn how to walk, then you need to learn how to run, then where to run to from there is unlimited. I hope to power you along the way and I hope your success helps power me as well. Now on to my story and how it has brought me to where I am today and the power of the mind. Which ultimately brought me to this program Mind Tamer. I didn’t like that idea, of stopping and then starting again for the fear of peeing all over the place. So I just held it with all my might. It hurt like hell but we made it to a gas station and I went to the bathroom. 2-Weeks had passed with no further incidence and the first day of school arrived. The 6th grades back then switched back and forth between rooms depending on what subject was being taught. My main teacher was Mr. Hain, and Mrs. Straub was the other one although for the first semester we had a sub Ms. Gillie (major crush on her 🙂 ANyway both classes were sitting in Mr. Hain’s room and he was going over what to expect and all that. And all of sudden I had the major urge to go to the bathroom, just like before. I tried holding it as long as I good which was about 10 minutes, but eventually asked to go. Mr. Hain was in the middle of talking so I was very scared to ask, but it couldn’t wait any longer. This went on my entire 6th grade year. I had to go to the bathroom at least every 45 minutes when in school. And not like I have to go to the bathroom, it was like I HAVE TO GO NOW, or it is going to get ugly. And I truly believe it was because I was constantly thinking about it, and trying to think not going bathroom thoughts. It was only when I was at other places with other people too. When I was at home doing homework, or playing video games I could go hours without going to bathroom. What the mind thinks about the most, the universe sees that it is done. Eventually my bathroom problem got so bad that they took me in for tests to make sure I didn’t have anything wrong with me. There was nothing. It was only in my mind. Junior High, 7th grade and 8th grade was upon me now. My bathroom problem got a little easier now, because I had 7 different teachers and 8 period changes to go to the bathroom, but it still was an issue, as each class was 50 minutes long so some classes were an issue. And most of the teachers were pretty strict about bathroom breaks during class. But it was a lot easier then the 6th grade. The classes that were the easiest to make it through was Gym class, as I was always doing something else other then thinking about it, sometimes I could even make it through 2 class periods, gym and the math class afterwards. And the other was wood shop, again mind was elsewhere during that class. High school was now upon me. My freshman year saw a mild improvement, it was about every 2 periods I would have to go. I was simply able to concentrate more on what was going on in class and it didn’t affect me as much. The teachers were more loose about bathroom breaks during class so that was a relief as well. Sophomore year I think I got back to a normal routine. I would usually go after home room, then in between 3rd and 4th period, after lunch, and in between 5th and 6th period. Again just more focused on what was going on in class (not that my grades reflected that 🙂 and less focused on going to the bathroom. So I use this story showing people just how powerful your mind can be. What you think about comes about. Some things are easier to come about then others. During the first module you will be learning the most, especially in regards to the mind and taming it so you are in control. The college years. Yes 7 years it took me. Most of the time was spent at The Ohio State University and some at Columbus State Community College. Going into college at OSU my freshman year I chose theatre as my major, I really had no idea what I wanted to do with my life. I chose it because of Sylvester Stallone. I, like everybody else started off taking all the general education classes that everybody is supposed to take. My second quarter there, I had discovered the art of multiple meals during the day to put on weight. All through High school I was trying to gain weight but 162 was the biggest I could get up to and that was during my junior year. 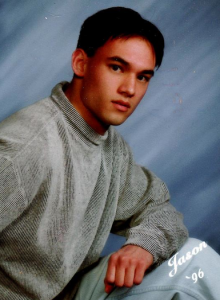 My senior year I got really sick with a virus and lost 13 pounds in 12 days, and could never get the weight back. Once I discovered the multiple meals a day in my second quarter I went from 167 to 207 in just 5 months. My focus was on eating and training so my grades dropped a lot. I eventually got up to 222 that year and 234 was the biggest I ever got. That was when I changed my major to exercise science. Although I quickly found that I couldn’t pass the math and chemistry requirements for that major, so I changed it again to Sports and Leisure studies with an emphasis on Fitness, Coaching and Recreation. Which was actually a popular major for some of the football team. One class I took in the summer before OSU won the National Championship I was in a class with Chris Gamble, Shane Olivea, and Drew Carter. It was pretty awesome. I failed both the math and chemistry at that major too. So I decided to go to Columbus state and try those classes there. Took me 2 quarters in the chemistry and 4 total for the math. The chemistry my final grade was actually a 46% but it was curved up to a C. Apparently I’m not the only one with chemistry problems. Moving along to my senior year. Still had no idea what I wanted to do with my life. We had to go through 4 internships during my senior year. The places I went to were as a Personal Trainer Intern for the YMCA North, and Gillie Recreation Center. Also the Hoop Basketball and Fitness Center, and finally Peak Athletic Development. So I then graduated in the fall of 2003, and scheduled to take my Certified Strength and Conditioning Specialist (CSCS) test in January. After I got that back I applied to everywhere to try and become a strength coach. But I had no experience except for a 3 month internship. I did apply for personal trainer jobs and got one at Bally’s but quit within a week. Working in a gym I do not want to do. So jobless, I started looking at ‘normal’ jobs and was hired at Discover Card in New ALbany in August of 2004. Where I worked until February 2005. This job was probably the low point in my life. It started off ok, but you can only take so much of people yelling at you and you yelling at them every day. I was in collections. It made me very angry all the time and depressed. So I knew I needed to get out, so I started looking at places I could go to see what was out there for me. I let my friends know what I was doing and one of them, an old roommate, said his roommate was moving out and he needed someone to move in. So I was Chicago bound. I lived in a western suburb, Carol Stream, while out there. Once there I applied to a bunch of different Athletic Training companies. And eventually got a intern position with Unicus Sports and Fitness. They were just developing their AThletic Training programs so I was going to be a major part of that once it got going. But I would need to do other training, bootcamps and personal training in the meantime. So to become a bootcamp trainer I needed to go through the bootcamp for a week. So I did, but according to the owner I wasn’t qualified to teach his bootcamps because I couldn’t pass the ‘cardio’ section of the bootcamp. I was too slow. Keep in mind I was between 220-225. This is why my bootcamps are completely void of cardio. It isn’t effective training. So I still helped Unicus out with other projects and events, but I really wanted to be a strength coach at a college or high school. So I looked at everything I needed to do for that, and started applying for internships at major universities. I got one at the University of Louisville. So I lived in Chicago from February- September 2005. I started the internship with U of L in September. Unpaid internship. I interned with them for 1 year. Loved it and thought that that was what I would do with my life. I worked primarily with girls soccer, basketball and softball teams, but also worked with both swimming and track and field teams. Did the internship until the August 2006. The head strength coach informed me that I needed to get my masters degree to become a college strength coach, so that was what I intended to do. I applied all over to the best master degree programs for strength and conditioning. I eventually got accepted to East Stroudsburg University in PA. It’s nearby the Poconos mountains. Very small town. So I started there in August of 2006. But when I moved there I was supposed to move in with a couple of girls, sisters. But 3 days before we are supposed to move in the landlord calls and says it’s not going to be ready until 9/15 (18 days away). I was already there and planning on staying in a hotel for those 3 days. That changed. And then a couple days after that I get a call from one of the sisters that her sister was in an accident and they wouldn’t be starting school until the next semester. Only having $800 to my name I didn’t have anywhere to go. So I lived in my car pretty much. Would go to the gym to workout and shower there. School started about 10 days after I got there, and it took me three days to realize that this is not for me. I can’t stand school. So I dropped out. Luckily the school wasn’t going to charge me at all for the student loans. So for the 13 days I had been there, my life was basically- sleep in my car in the parking lot in between Wal Mart and Friendly’s (and I wasn’t the only one doing this), wake up, walk to Wal-Mart, go to the bathroom, get any food items needed for the day (my diet pretty much consisted of grape juice with 1/2 scoop whey protein powder, and saltine crackers with peanut butter, I did this 6-7 times a day). Then I would either go to the gym or if it was an off-day I’d go to the student rec center to shower and shave. Then I’d spend pretty much the rest of the day in the library, with breaks to go eat in my car. So needless to say I got a lot of research and reading and thinking done. 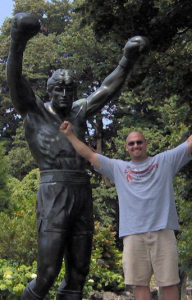 So thinking my life in East Stroudsburg, PA was over I set plans to move back home to Columbus, but before I did that I found out that in 5 days there was going to be a re-dedication of the Rocky Balboa statue in Philadelphia. Well, I couldn’t miss that! So I just continued living in my car, then the 2 nights before, headed over to Philly about a 2 hour drive. It was definitely worth it. One of the more memorable days in my life.The day before the dedication I did the Rocky tour, went to Mick’s Gym, Paulie’s House, Rocky’s Apartment. 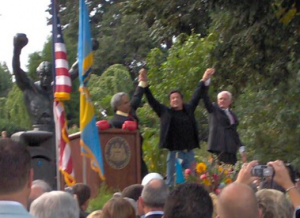 You can read about the statue and I’m actually mentioned in a story from the Philadelphia Enguirer, http://www.pophistorydig.com/?tag=rocky-statue-history, I still have the paper, I stayed another night just to get it. I told them I had driven from Columbus for it though. (makes a better story :). It was the first time I had ever seen the steps. My dad, brother and I had looked for them when I was younger but never could find them. I remember starting to cry as they first came into view. Rocky and Sly were and are my biggest inspirations in life. So I get to the steps and of course, ran up them. Then back down, took some pictures, back up, took some more pictures. Then I got my picture by the statue. Then I lined up by the gate and waited. When he first came out, it was liked being punched in the gut, I couldn’t breathe for like :15. 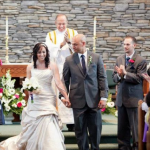 The entire ceremony lasted about 25 minutes. Again one of my favorite memories and something i will never forget. So then I came home. Lot of thinking on the way back. Was going to open up my own place. And heal my back. I had injured my back deadlifting in 2004. Had a herniated disc. Moved back in with my mom. Then a month later moved into a studio apartment up off of Morse rd and Karl. Worst apartment I’ve ever lived in. But for what I needed at the time was perfectly fine. During the time I was not lifting I was went through a major depression. Working out was my one true love and had been doing it since the 8th grade and playing sports since the 1st grade so that kind of stuff was apart of me. It really really sucked. I knew that I had to get back to lifting ASAP. So around the 3rd month of the 5 recovery I started tripling the efforts to heal my back, and it worked. Day by day, little by little. That 5th month I had found a website from a guy named Zach Even-Esh, he owned something called the Underground Gym in New Jersey. I started watching all his Youtube videos, and loved the way he trained and how he trained athletes. He trained them a lot with just stuff that was old school, kind of like how Rocky trained for his fight against Drago in Rocky IV. He’s the one that got me hooked onto kettlebells. So before I was even fully healed I bought my first kettlebells, a 30 and 40 pounder. My first workout back was very depressing. I couldn’t even do 10 pushups. So I knew I had my work cut out for me. But the fact is that I was back, and extremely motivated to move forward and get out of this bad funk and start doing what I wanted to do. It took me a full 5 months to get back to where I wanted to be, which was between 206-210, and I eventually got into the best shape of my life. I also was introduced to intervals as well. It was here in October that I first launched my business Yun Strength and Fitness Systems LLC. Got my business liscence, paid for my first website http://www.yuntraining.com and started getting to work on the site. The site took me forever, because I wanted to make it perfect, and I didn’t know what I was doing. I finished the webiste in December, at that time our main focus was athletic training and in-home personal training. It wasn’t until January that I got my first lead. A 12 year old basketball player. Our schedules never could mesh so that was out. Then in February I got 2 personal training clients. Training both of them together. YAY my first client! They lived in Lithopolis though which was like 45 minutes a way. I didn’t care though, it was my first paying client. I trained them for about 6 months, while I was still working my other job. In June I bought a program on how to start bootcamps, followed through with that pretty heavily and in August, Yun Fitness Bootcamps was born in August of 2008. I started off just doing free bootcamps in a park then eventually moved to a shopping center’s grassy area, then in October moved into a martial arts studio. That was my light switch moment for me. My Ah-Ha moment. I realized that I have the power to change lives. So I had better figure out this business thing real quick. I struggled along growing the bootcamp as best I could with my methods. 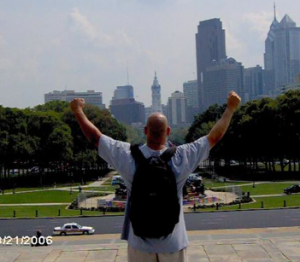 Then in November 2009 I joined a group called the bootcamp blueprint who was headed up by a guy named Pat Rigsby. It was there that I learned several techniques that helped me double my business in less then a year. All because of coaching. I didn’t know what I was supposed to do for this or that, but I hired someone that knew what to do. Of course it took massive action on my part. But it was at this point in my life I learned that I needed a coach to help me reach the next point in my business and life. Late 2010 I was approached by Pat Rigsby to join his second Mastermind group. A mastermind group for those of you that don’t know, is a group where like minded people come together to help each other out. 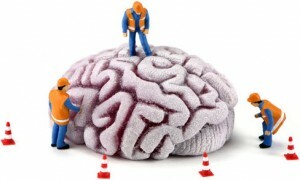 More minds are better then one. They offer support to each other, and help out with questions and concerns and become friends. It was kind of the same idea as bootcamp blueprint except these were handpicked people by Pat as people who he thought were the best. It was lot more expensive then the blueprint but I knew it was what I needed to go to that next level. So I joined. My first year with the group I doubled my business again. It was amazing that the power of the group had. Plus the accountability. We had and have to checkin every week with our successes and any questions, and believe me you don’t want to be the slacker of the group. 2010 was also the year I started getting more into mindset type stuff. I had rented the secret from the library and listened to it 3-4 times in a month. Letting it steep into my brain. The one thing I don’t like about The Secret is they don’t talk about the most important thing which is taking ACTION, but it was the starting point I needed to setting my mind right. Which is the purpose of Mind Tamer. I still listen to the secret about 2x a year now. But that led me to more books on mindset as well. I read the Master Key System, which the Secret was somewhat based off of. Then it was Psycho-Cybernetics. And on and on. Don’t worry about getting any of these now, that will come in time. In December of 2010 I launched the online workout site LBN Online Strength and Fitness Workouts (http://www.lbnonlinefitness.com). It went by a different name then but the premise is P90X meets Netflix, log in, pick your workout and workout with me at home. I’ve brought my wife on board to help with the marketing as I don’t really have the time. but we are focused on growing this more then anything as we see the potential around the world for this type of service. In 2011 in May, I opened up a third bootcamp location. In September 2011, I opened up my youth sports and fitness franchise, AThletic Revolution-Hilliard. This has been a struggle to get going off the ground simply because I did not have the right mindset around it. I was treating it like a hobby and focusing more on my other businesses. SOmething my business coach taught me about owning multiple businesses is that if I don’t plan to develop it, it won’t get developed. Much like if you don’t plan your future by setting and writing goals, nothing happens that you want to happen. We are expecting magical things to happen with this business in the latter half of 2012 and 2013. In 2012 I hired two more coaches. I had switched customer management software. The one I had before was very very basic, and the one I switched to is like the Rolls Royce of software. So I hired a coach for 6 weeks to take me through it and learn it as best I could. It would of taken me months and possible years to get it all down. My mindset was focused on my goals and I knew I didn’t have time to mess around with this stuff for too long. The second coach I hired was a virtual one for mindset. My mindset had come a long way since 2010. I used to get upset about everything and my temper could just blow at anything, especially small things. But with work and reading and learning all that I could, I have changed the way I think, and in return my life has changed forever. But it isn’t a simple process, it’s a lifelong process and I realized that. So I hired a former Navy Seal Commander to be my mental coach. At the time of writing this I have only been with him for 3 months, but I can see the biggest improvements ever in my mindset in just those small three months. So that brings us to you. I had known I always wanted to make my programs complete— in terms of physical, body and mind. I simply did not know how to do that. But I realized that the answers are out there. 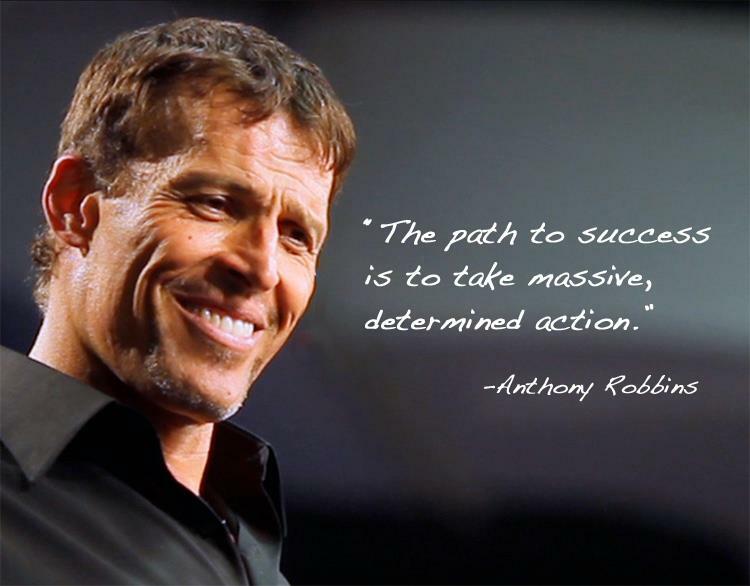 I have to be proactive and take massive action and the answer will come. You will hear that all the time from me in this program. MASSIVE ACTION. If you just sit on what you learn here nothing will come about. NOTHING. Change takes work. And I know you are ready to change because I presented you with an offer and you accepted. The group, myself will hold you accountable. There will be checkins and homework. Education in my mind never ends once school is over. It did for me right after I got out of college and it was one of the worst periods in my life. I had no goals and no ambitions. We always have to be heading towards something to have meaning in our life. I’m sure over time my goals will change. One of my favorite mentors, Craig Ballantyne, tells people to write goals 10 years in advance. I did this, but soon thereafter realized, 10 years is too far in advance. I have no idea what I will want in 10 years. But I do have a vision, an overall vision of what I’d like to accomplish in 10 years. So I am hoping that I can help inspire change in you and inspire you to take MASSIVE ACTION. I’m hoping you will make a lot of new friends as result of this program. Here is to CHANGE, here is to the NEW YOU!